Sicamous, British Columbia, is conveniently located on the shores of two beautiful lakes; Mara Lake and Shuswap Lake and has earned the title of Houseboating Capital of Canada. Both these lakes offer a wide variety of activities for the BC summer visitor, from swimming and water skiing to houseboating and exploring. 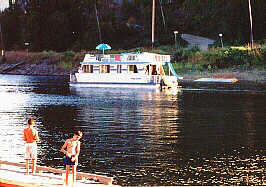 Accessed from Sicamous, visitors on houseboating vacations enjoy over 1,000 km of shoreline on Shuswap Lake. 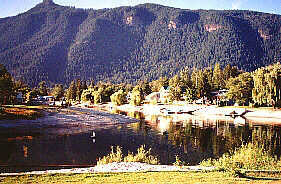 The area surrounding both Shuswap Lake and Mara Lake has an abundance of mountains, lush valleys and rivers to explore; a wide variety of fish and wildlife that can be seen at various times of the year in the more remote areas. There are an abundance of orchards and farms in the Sicamous - Shuswap area to supply delectable fresh treats throughout the growing season. From both Vancouver, BC, and Calgary, AB, it is about a 5 hour drive or bus ride to reach Sicamous and only seven hours from Seattle, Washington. There are also direct flights from Vancouver, BC. Climate: hot in the summer with moderate to cold winters. 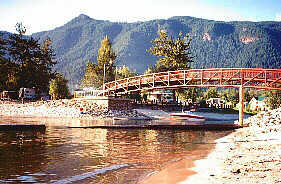 Recreation Facilities & Activities: golf course; fishing; swimming; houseboating; water skiing and parasailing; sandy beaches; commercial water slides in nearby Salmon Arm; fishing derby. Local Attractions: Art show; Paddle Wheeler Cruises. 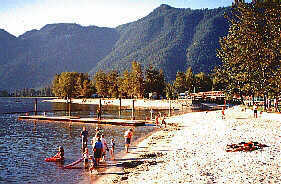 Accommodations: The Sicamous area offers hotels and motels with provincial and private campsites often right in the town.